Most of us have a favorite hymn - a song we sing in worship that touches our soul to inspire and move us. I believe the same is true of what we habitually call "secular music". Our worship on Sunday, November 8th will feature and celebrate music of all kinds -- not just music we immediately identify as "religious". To help in putting this service together we would like to receive from you a favorite song of any genre that touches your heart or stirs your spirit. 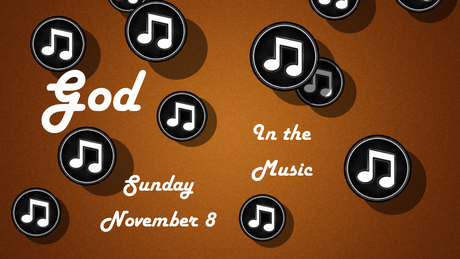 Songs of all kinds will be shared in worship on November 8th. Please contact Pastor Eliot by November 6 with your favorite hymn or song to sing.